We’ve got a short week with some good food planned for you. We’d love to see you at the table! 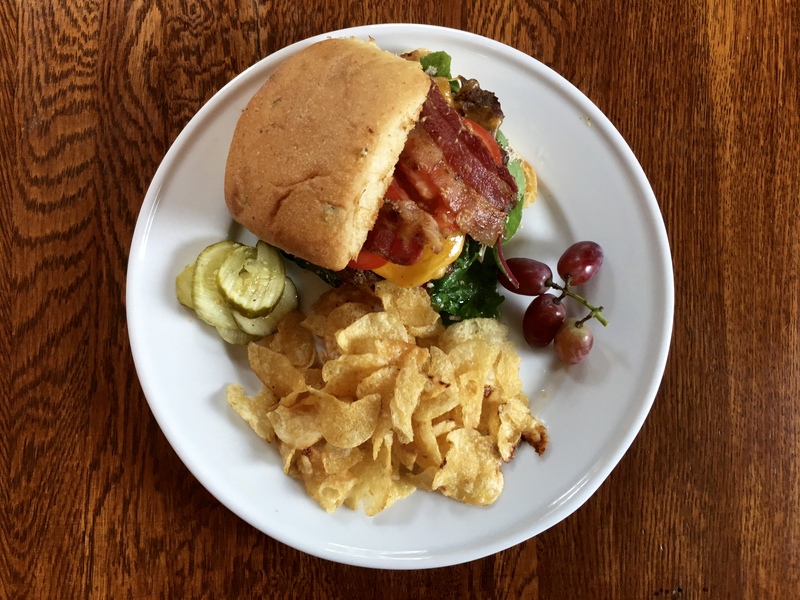 Here’s what we’ve got cooking for you this week: Louisiana red beans and rice, white lasagna, and our house-made hamburgers. Special made Louisiana red beans and rice with hot water cornbread and house salad. Our red beans come fully and deeply flavored, cooked in our own house-made smoked ham hock stock that will totally set the week in motion. First, the weather report, then some terrible dance music, and then, the news from Professor Farrell of the Mount Jenning Observatory: an explosion had rocked Mars. Suddenly, the announcer begins describing an alien landing in a farmer’s field in Grovers Mills, New Jersey, ““Good heavens…something’s wriggling out of the shadow like a gray snake. Now here’s another and another one and another one. They look like tentacles to me … I can see the thing’s body now. It’s large, large as a bear. It glistens like wet leather. But that face, it… it … ladies and gentlemen, it’s indescribable. I can hardly force myself to keep looking at it, it’s so awful. The eyes are black and gleam like a serpent. The mouth is kind of V-shaped with saliva dripping from its rimless lips that seem to quiver and pulsate.” That’s how a young Orson Welles scared the pants off the nation way back in 1938 with his vivid radio retelling of H. G. Wells’ The War of the Worlds. Mr. Welles suddenly found himself at the center of a federal investigation because folks totally panicked, thinking the invasion was real. After he was cleared by the Federal Communications Commission of any criminal wrongdoing, he sat down to one of his favorite comfort foods: read beans and rice with a nice red wine and a single rosebud in a vase on the table. Well, on this All Hallows Eve, we’ve got something that will cure whatever ails or scares you: home-cooked Louisiana red beans and rice. White lasagna with an artichoke and spinach béchamel sauce with chicken and a puttanesca red sauce as the bottom layer. The milky smooth béchamel sauce has a few friends named artichoke and spinach over for an afternoon repast on fresh lasagna chaises around the pool, and they are joined by some chicken a scrumptious little puttanesca red sauce. Larry the Cable Guy jokes about his wedding, “Our whole wedding cost 180 bucks. Afterward, we re-heated lasagna for everyone and set off fireworks.” Well, our lasagna is freshly made just for you, and we’d love to see you at the table. You can bring your own fireworks. If you can’t make it for lunch on Wednesday, just give us a call at 267-4457, we’ll set aside some supper for you including house salad, white lasagna, and house-made bread. House-made hamburgers on jalapeño buns with all the trimmings. Well, what’s better than home-made hamburgers, jalapeño buns, and lots of trimmings? Nothing. Martial arts actor Jet Li observes, “In the States, you can buy Chinese food. In Beijing you can buy hamburger. It’s very close. Now I feel the world become a big family, like a really big family. You have many neighbors. Not like before, two countries are far away.” Well, there you have it. Hamburgers make a really big family. Come join the global family with a hamburger. Columnist P. J. O’Rourke wonders, “The mystery of government is not how Washington works but how to make it stop.” Yep.